Bats have an amazing ability to use radar to avoid obstacles as well as predators, but there are some predators who have these night flyers figured out. Some swoop suddenly out of nowhere, grabbing bats in flight before the bats can react. Others wait until daylight when the bats are sleeping to attack them in their roosts. A variety of mammals eat bats when they can. Animals such as weasels, minks and raccoons climb into areas where bats roost and eat them while they sleep during the day. These mammals also lie in wait just outside a bat roosting area to pounce on bats as they enter and exit the roost. Some larger bats prey on smaller bats when they share habitat areas. Birds have an advantage over some mammals because they can catch bats in flight. Birds such as owls, hawks and common grackles grab bats out of the sky, particularly when they are leaving and entering a roost. The narrow openings of many roosts cause bats to group together, making it easier for birds to swoop down and grab a tasty bat treat. Because of their wingspan, it often appears bats are larger than they are. Bat bodies typically are small; the light brown bat, for example, has a body about 4 inches long and weighs less than half an ounce. This makes them suitable prey for large spiders and insects such as centipedes. A large centipede, usually longer than the bat body, crawls up the ceiling of the roost and extends his body down beside a bat. He attacks the bat from the head to incapacitate him, then eats his fill as he hangs from the ceiling. If they fall, the centipede can continue to munch from the floor of the roost, where he might be joined by other insects. Spiders might also jump into the feast of a fallen bat, although some can take bats while they sleep suspended from the ceiling of the roost. These spiders, such as tarantulas, are large, often 4 to 6 inches, and some use webs to subdue the bats, like those from the genus Nephila. Snakes are common bat hunters, but there are a few that are a bit more surprising. Some fish, for example, wait until the bats fly close to the top of the water in search of insects and grab them from below. Bullfrogs use a similar technique, lying in wait until a bat flies close enough to catch. Many people are repelled by the look of bats and the fear that bats might carry disease. It turns out that fear is justified. 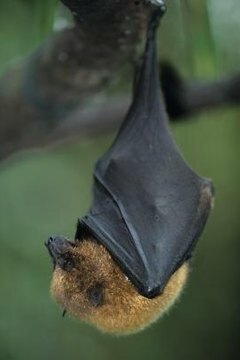 In areas of the world where it's common for people to eat bats, those people can catch diseases from the flying mammals. In Guam, for example, the flying fox bat can carry neurotoxins that the humans ingest. This leads to widespread neurological disorders in those who eat the bats, according to National Geographic. In some areas of Africa, fruit bats can carry the ebola virus, which is transmitted to humans who eat those bats. Ebola is extremely contagious; when a human contracts ebola, he can transmit it easily to many other people through something as simple as a handshake. What Eats: What Eats a Bat?